UVA Recycling will provide recycling bins for your event. Contact UVA Recycling at (434) 982-5050 with an attendance estimate. Recycling bins will be transported to and picked up after the event ends. Each room will be issued a stackable two-bin recycling unit. One bin is for mixed paper, and one bin is for plastics, metals and glass. Contact UVA Recycling if your room does not have one or both of these recycling bins. Each room will be issued a stackable two-bin recycling unit. One bin is for mixed paper, and one bin is for plastics, metals and glass. In the event that one or more bins are missing, contact UVA Recycling to acquire another recycling bin. 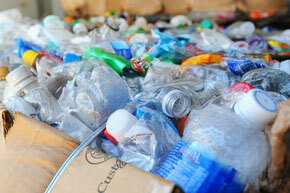 Please contact UVA Recycling at (434) 982-5050 to request recycling bin delivery. To request a confidential paper bin or bottles/cans bin, contact your supervisor about the department’s protocol on recycling bins. To schedule a bin delivery, please contact UVA Recycling at (434) 982-5050. The ROSE Program (Reusable Office Supply Exchange) collects gently or never used office supplies from departments throughout UVA and makes these materials available to the community. Stop by the Recycling warehouse to drop off or take whatever supplies you like! The ROSE Program is located in the Recycling building at the end of Leake Drive, and is open Monday-Friday 8 a.m.-3 p.m. If you would like to make a donation to the ROSE program, please call UVA Recycling at (434) 982-5050.